This year we wanted a change from our traditional Christmas Table Setting, after some careful deliberation we decided on a Nutcracker Christmas table. This table setting allows for some creative arrangements and a lot of fun. We decided on gold chargers and flatware and added a vintage white, gold and burgundy dinner set. 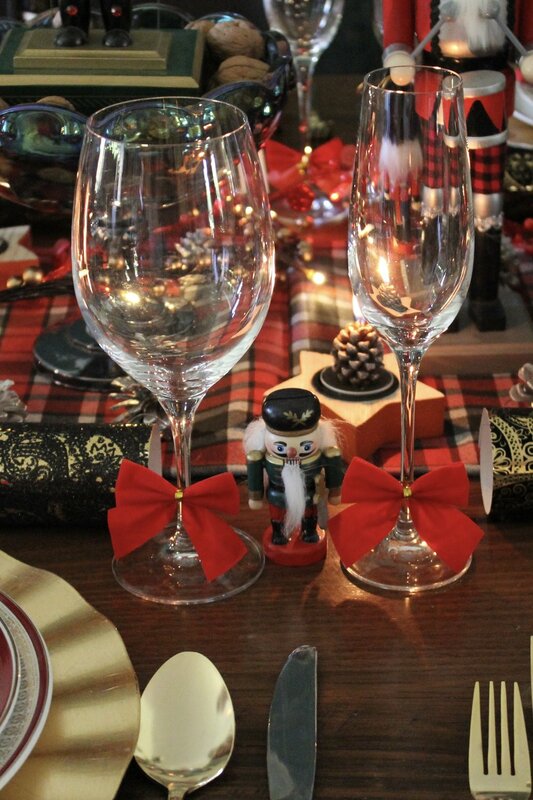 Each place setting was topped with a nutcracker. Our table centre piece was a very large nutcracker, we used a berry garland around the base. We used small pine cone candles to throw shadows on the table. Large wooden candle sticks were decorated with Christmas greenery and berries . Small red bows were attached to the stems of our glassware. We used a large selection of nut crackers in various sizes and colours. A musical nutcracker was placed in a bowl of walnuts and a small nut cracker perched on the base of the candlestick. I decided on black and gold flocked bon bons and a checked table runner. The table looked wonderful during the evening with a lovely warm glow from the candles.